LEAH'S LIFE: Lemonade stand....or was it? After work today I was driving down the road talking to my sister on the phone. I saw some children on the side of the road selling lemonade. Whenever my sister sees children selling lemonade she stops and buys some. Since I was on the phone with her for some reason I felt guilty for not buying any, because she always does. So, I hung up the phone and turned around to buy some. These kids had a legit sign that they colored with their crayons and everything hanging up in the tree. I was really impressed. 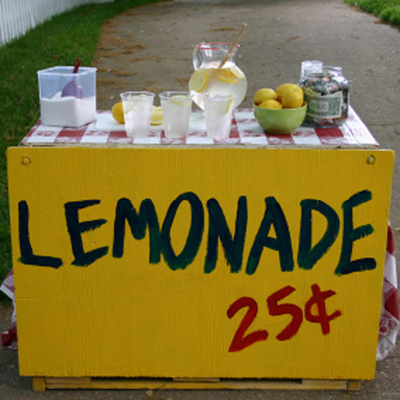 Lemonade was 50 cents. They asked me if I wanted one or two cups (good selling technique I thought). I told them just one but that I would just give them a dollar anyway. I commented on how impressed I was with their sign and asked them if they had made it. They said yes and that it was hard for them to hang it up in the tree and that their mom helped them. What a cute little family business they had going on! They had the cooler of lemonade sitting on a chair and the chair had cardboard on it. I don’t know why, but for some reason there was a picture of a scantily clad woman glued to the cardboard on the side of the chair. I had already purchased the lemonade and gave them an extra 50 cents by the time I noticed this picture. Hmmm… I wonder what kind of cause I was supporting and gave them an extra fifty cents for it! Oh dear... What a sweetie you are to stop and buy some though! I love that!